Compaction is the process by which the volume of air in an HMA mixture is reduced by using external forces to reorient the constituent aggregate particles into a more closely spaced arrangement. This reduction of air volume produces a corresponding increase in HMA density (Roberts et al., 1996). Figure 1: A Steel Wheel and a Pneumatic Tire Roller Working Side-by-Side. Compaction is the greatest determining factor in dense graded pavement performance (Scherocman and Martenson, 1984; Scherocman, 1984; Geller, 1984; Brown, 1984; Bell et. al., 1984; Hughes, 1984; Hughes, 1989). Inadequate compaction results in a pavement with decreased stiffness, reduced fatigue life, accelerated aging/decreased durability, rutting, raveling, and moisture susceptibility (Hughes, 1984; Hughes, 1989). Compaction reduces the volume of air in HMA. Therefore, the characteristic of concern is the volume of air within the compacted pavement, which is typically quantified as a percentage of air voids in relation to total volume and expressed as “percent air voids”. Percent air voids is calculated by comparing a test specimen’s density with the density it would theoretically have if all the air voids were removed, known as “theoretical maximum density” (TMD) or “Rice density” after the test procedure inventor. Percentage of TMD (or “percent Rice”). This expression of density is easy to convert to air voids because any volume that is not asphalt binder or aggregate is assumed to be air. For example, a density reported as 93 percent Rice means that there are 7 percent air voids (100% – 93% = 7%). Percentage of a laboratory-determined density. The laboratory density is usually a density obtained during mix design. Percentage of a control strip density. A control strip is a short pavement section that is compacted to the desired value under close scrutiny then used as the compaction standard for a particular job. Cores (Figures 2 and 3). 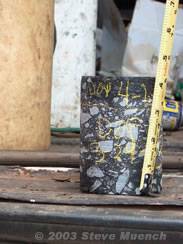 A small pavement core is extracted from the compacted HMA and sent to a laboratory to determine its density. Usually, core density results are available the next day at the earliest. This type of air voids testing is generally considered the most accurate but is also the most time consuming and expensive. Nuclear gauges (Figures 4 and 5). A nuclear density gauge measures in-place HMA density using gamma radiation. 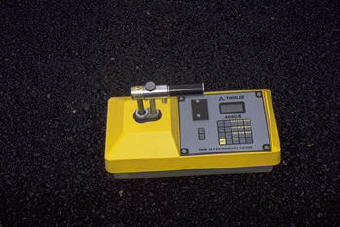 Gauges usually contain a small gamma source (about 10 mCi) such as Cesium-137 located in the tip of a small probe, which is either placed on the surface of the pavement or inserted into the pavement. Readings are obtained in about 2 – 3 minutes. Nuclear gauges require calibration to the specific mixture being tested. Usually nuclear gauges are calibrated to core densities at the beginning of a project and at regular intervals during the project to ensure accuracy. Each contracting agency or owner usually specifies the compaction measurement methods and equipment to be used on contracts under their jurisdiction. HMA compaction is influenced by a myriad of factors; some related to the environment, some determined by mix and structural design and some under contractor and agency control during construction (see Table 1). 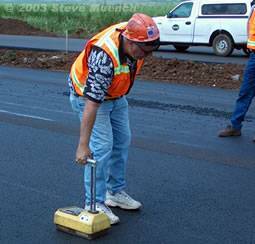 HMA temperature directly affects asphalt binder viscosity and thus compaction. 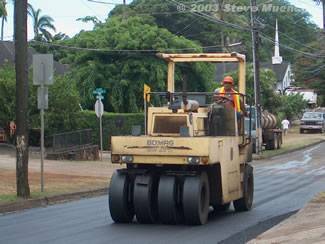 As HMA temperature decreases, the constituent asphalt binder becomes more viscous and resistant to deformation resulting in a smaller reduction in air voids for a given compactive effort. As the mix cools, the asphalt binder eventually becomes stiff enough to effectively prevent any further reduction in air voids regardless of the applied compactive effort. The temperature at which this occurs, commonly referred to as cessation temperature, is often reported to be about 175°F for dense-graded HMA (Scherocman and Martenson, 1984; Hughes, 1989). Below cessation temperature rollers can still be operated on the mat to improve smoothness and surface texture but further compaction will generally not occur. By applying its weight to the HMA surface and compressing the material underneath the ground contact area. Since this compression will be greater for longer periods of contact, lower equipment speeds will produce more compression. Obviously, higher equipment weight will also increase compression. By creating a shear stress between the compressed material underneath the ground contact area and the adjacent uncompressed material. When combined with equipment speed, this produces a shear rate. Lowering equipment speed can decrease the shear rate, which increases the shearing stress. Higher shearing stresses are more capable of rearranging aggregate into more dense configurations. These two means are of compacting HMA are often referred to collectively as “compactive effort”. Steel wheel rollers (see Figures 6 and 7) are self-propelled compaction devices that use steel drums to compress the underlying HMA. They can have one, two or even three drums, although tandem (2 drum) rollers are most often used. The drums can be either static or vibratory and usually range from 35 to 85 inches in width and 20 to 60 inches in diameter. Roller weight is typically between 1 and 20 tons (see Figures 5 and 6). Some steel wheel rollers are equipped with vibratory drums. Drum vibration adds a dynamic load to the static roller weight to create a greater total compactive effort. Drum vibration also reduces friction and aggregate interlock during compaction, which allows aggregate particles to move into final positions that produce greater friction and interlock than could be achieved without vibration. As a general rule-of-thumb, a combination of speed and frequency that results in 10 – 12 impacts per foot is good. At 3000 vibrations/minute this results in a speed of 2.8 – 3.4 mph. Pneumatic tire rollers are self-propelled compaction devices that uses pneumatic tires to compact the underlying HMA. Pneumatic tire rollers employ a set of smooth tires (no tread) on each axle; typically four or five on one axle and five or six on the other. The tires on the front axle are aligned with the gaps between tires on the rear axle to give complete and uniform compaction coverage over the width of the roller. Compactive effort is controlled by varying tire pressure, which is typically set between 60 and 120 psi (TRB, 2000). In addition to a static compressive force, pneumatic tire rollers also develop a kneading action between the tires that tends to realign aggregate within the HMA. 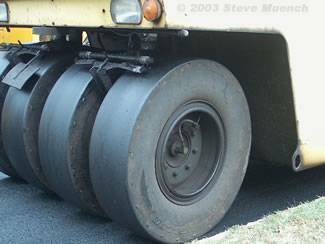 Because asphalt binder tends to stick more to cold tires than hot tires, the tire area is sometimes insulated with rubber matting or plywood to maintain the tires near mat temperature while rolling (see Figures 8 and 9). Screed. The screed is the first device used to compact the mat and may be operated in the vibratory mode. Approximately 75 to 85 percent of TMD will be obtained when the mix passes out from under the screed (TRB, 2000). Breakdown Roller. The first roller behind the screed (see Figure 10). It generally effects the most density gain of any roller in the sequence. 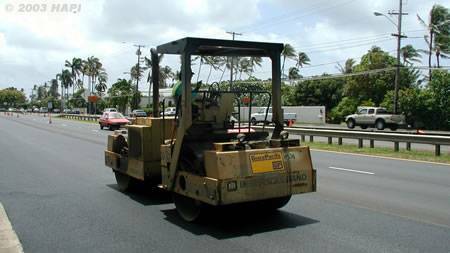 Breakdown rollers can be of any type but are most often vibratory steel wheel and sometimes pneumatic tire. Intermediate Roller. 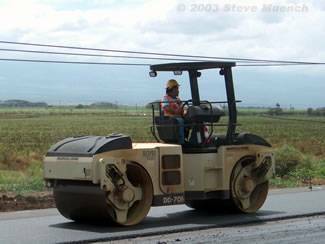 Used behind the breakdown roller if additional compaction is needed (see Figure 10). Pneumatic tire rollers are sometimes used as intermediate rollers because they provide a different type of compaction (kneading action) than a breakdown steel wheel vibratory roller, which can help further compact the mat or at the very least, rearrange the aggregate within the mat to make it receptive to further compaction. Finish Roller. The last roller in the sequence (see Figure 11). It is used to provide a smooth mat surface. Although the finish roller does apply compactive effort, by the time it comes in contact with the mat, the mat may have cooled below cessation temperature. Static steel wheel rollers are almost always used as finishing rollers because they can produce the smoothest surface of any roller type. Traffic. 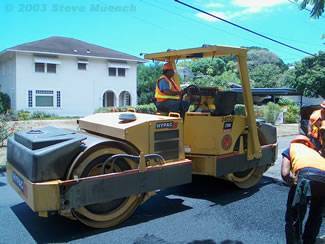 After the rollers have compacted the mat to the desired density and produced the desired smoothness, the new pavement is opened to traffic. 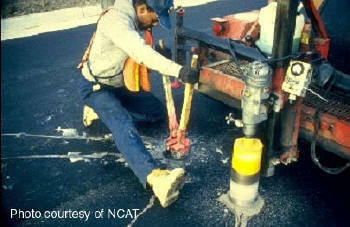 Traffic loading will provide further compaction in the wheel paths of a finished mat. Traffic may compact the mat an additional 2 to 4 percent over the life of the pavement.